Last week Marie Forleo posted an interview with Adam Braun, the founder of Pencils of Promise, a "for-purpose" (not-for-profit) organisation that builds schools for children in developing countries. I was so moved by this video that I had to share it with everyone I know. Pencils of Promise has built over 170 schools in 6 years and has no plans of stopping yet. It is quite a remarkable story, yet anyone of us can do it. Adam started by placing $25 into a bank account in the name of Pencils of Promise and 6 years later he is helping improve the future of all of the students who are lucky enough to attend his schools, and subsequently their respective countries. While the purpose of the interview was to promote Adam's new book "The Promise of a Pencil", the underlying message throughout is that every single one of us has the power and the ability to make a change. If you feel strongly enough about something and are passionate about it, you will have the drive to do it. When you are in-sync with the universe and are making a positive impact, you will find that you won't be acting alone for long. Positivity breeds positivity. This is how to start a movement. The whole idea of one person making an incredible impact on society initially seems limited, restricted and foreign to us, but when you really look at it, we are surrounded daily by global trailblazers, who too, started with little to no backing and changed our world for the better. The likes of Nelson Mandela, Martin Luther-King and Oprah. We must trust that we will be guided and supported and that we will attract the right people to help spread our message. We also have a little thing called the internet, and with this tool, amazing things can be accomplished. We are able to connect to people on the other side of the world within seconds, allowing people from all walks of life to come together. While there is only so much we can physically do as an individual in the world, when we come together and share a vision, the possibilities are endless. This instantly got me thinking about my strengths and the goodness that I can help bring to the world. I am very passionate about animal welfare, and my organisation of choice is The Orangutan Project. 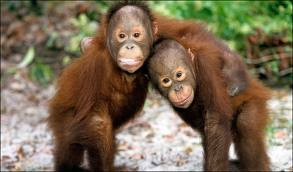 TOP are an Australian based foundation working locally in Borneo to acquire land to safely re-habilitate and re-home orang-utans. While I have been donating to the foundation for a number of years, I realised there is a lot more I could be doing. So, since hearing about Adam's story, I have pledged to visit the TOP sanctuary as part of their volunteer program in 2015. Within my home we have also labelled our money tins with TOP's logo and will be donating all of our loose change to Borneo. I hope to expand on these small charitable efforts in the next couple of years. And remember, every smile is contagious, so go spread the good stuff.